ItBrella’s Team: Taylor Crowe, Mickey Kane, Max Kucer, and Grace Lagoner. Many of our employees have a soft spot for Butler...several are alumni, several are supporters of Butler Athletics, and most of us believe strongly in "The Butler Way." Our own Angi Sowers Dunlavy, Senior Account Executive, served as a judge for the 2018 TOP DAWG BUSINESS PLAN competition. TOP DAWG is a competition for the Butler Freshman Business class to generate an innovative and marketable new product complete with a supporting business plan and model. Student groups pitch their concept to the entire class and four finalists are selected to present to a panel of judges made up of members from the Indianapolis business community. 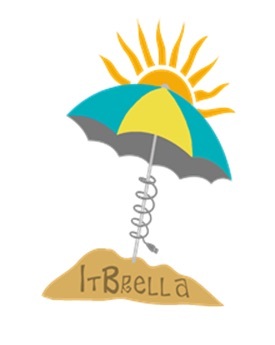 The 2018 TOP DAWG is ItBrella, a solar-powered beach umbrella that allows users to charge devices (phones, computers). Want to get involved with this innovative program? Contact the Andre B. Lacy School of Business, Butler University, HERE. 2017 Bob Poorman/ALS Golf Classic. From left to right, Matt Arent, Dave Harding, Tom Pinnick - HardingPoorman.